The City Center Townes development is still under construction, but owner and developer Lerner Enterprises expects the first people to move into the two- and three-bedroom town houses this summer. 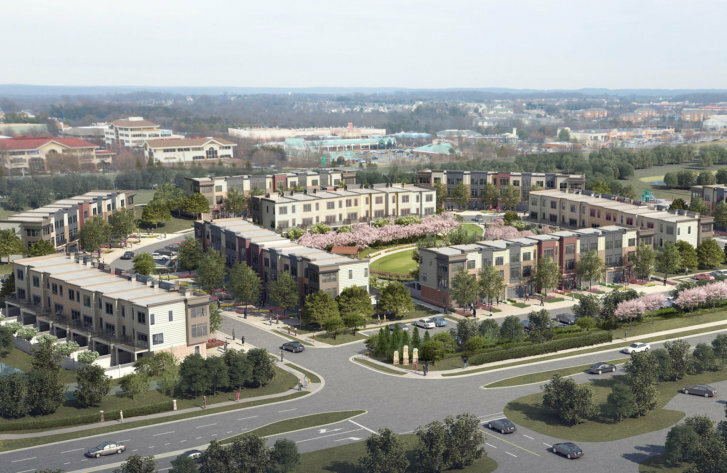 WASHINGTON — City Center Townes, the first rental town homes at Dulles Town Center, started leasing the first 30 of its 66 town houses that have been added to the Town Center master plan. The two- and three-bedroom town houses with garages start at $2,650 a month. Residents will have full access to existing amenities at the Parc Dulles community, including the massage room and spa, pool and fitness center, dog park, two children’s play areas and Hadley’s Park. The City Center Townes community also includes a clubhouse with catering kitchen and a theater. The town home development is within walking distance to Dulles Town Center and 185 stores and restaurants and Regal Cinemas. There will be complimentary shuttle service to the Whiehle-Reston East Metro Station. The City Center Townes development is still under construction, but owner and developer Lerner Enterprises expects the first people to move-in this summer.